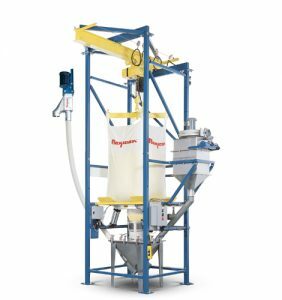 Bulk Bag Unloaders & Fillers | Phenix Equipment Inc.
Flexicon bulk bag fillers (also known as FIBC fillers) range from basic stand-alone units to sophisticated systems to match the budget and capacity requirements of each customer’s application. Each of these configurations delivers optimum performance across specific capacity ranges with maximum cost-effectiveness. 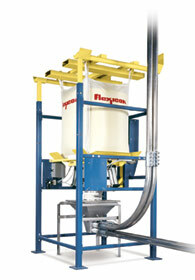 Flexicon’s patented TWIN-CENTERPOSTTM fillers satisfy low- to medium-capacity filling requirements and/or sanitary applications where frequent wash-down or compliance with USDA Dairy standards is required. Lighter-duty versions of TWIN-CENTERPOSTTM fillers, BASIC FILLERS reduce cost, yet offer an inflatable bag spout seal and feed chute dust vent as standard, and a limited list of performance options. 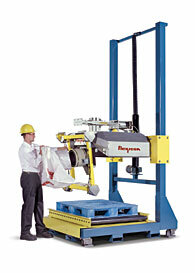 Flexicon’s latest bulk bag filling innovation is the patent-pending SWING-DOWN ®filler . 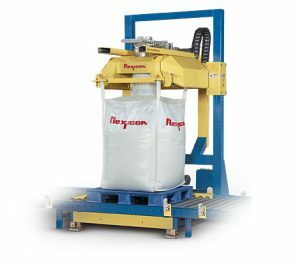 Designed for medium- to high-capacity applications, this revolutionary design brings the fill head to the operator at floor level for faster, safer and easier bag connections. 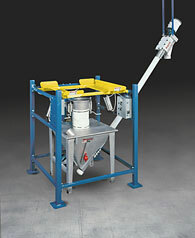 REAR-POST fillers are intended for medium- to high-capacity applications requiring pass-through conveyors and/or powered fill head height adjustment. 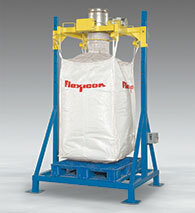 Flexicon BULK-OUT® Bulk Bag Dischargers, also referred to as bulk bag unloaders, FIBC unloaders, and FIBC dischargers, are offered in numerous frame configurations, the two most popular of which are: BFF Series dischargers with bag lifting frame for forklift loading and unloading of bulk bags (FIBCs), and BFC Series dischargers with cantilevered I-beam, electric hoist and trolley for loading and unloading of bulk bags without the use of a forklift. 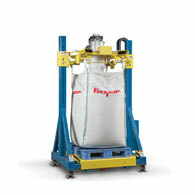 Other bulk bag unloader configurations include split frames for forklift loading of bags in low headroom areas, half frames for suspending bags during discharge using a forklift, hoistable frames for lifting the entire bulk bag discharger using an overhead crane, continuous loss-of-weight dischargers for uninterrupted feeding directly from bulk bags, and other designs satisfying highly specialized requirements.